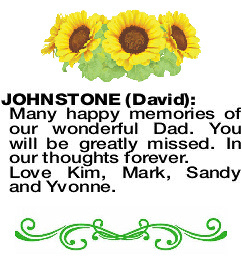 A Funeral Service to Celebrate the Life of the late Mr David Edwin Johnstone of Heathridge will be conducted in the chapel of KARRAKATTA Cemetery, Railway Road, Karrakatta commencing from the main entrance at 2.00pm MONDAY (08.04.2019). 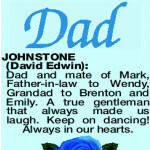 JOHNSTONE DAVID Many happy memories of our wonderful Dad. You will be greatly missed. In our thoughts forever. Love Kim, Mark, Sandy and Yvonne. 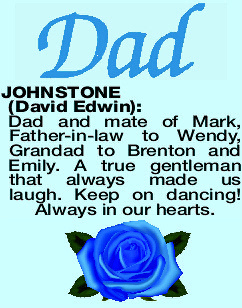 DAVID EDWIN Dad and mate of Mark, Father-in-law to Wendy, Grandad to Brenton and Emily. A true gentleman that always made us laugh. Keep on dancing! Always in our hearts. 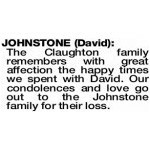 The Claughton family remembers with great affection the happy times we spent with David. Our condolences and love go out to the Johnstone family for their loss.